125 Feb. 1936-(continued.) Papers read. "An Ardent Patriot" by Mrs. George, who lived in Miss Willard's town. "Old Glory" was Miss Willard's emblem. She was the first, and so far, the only woman to have her statue in the hall of fame. Willard hall is doing even more good than the statue. Every noon some minister preaches, and talks on temperance. "A Resourceful Educator" by Mrs. George Lincoln Miss Willard was the first woman to be elected a president of a college. Teacher of liberal arts. Established self government among the girls. Believed in co-education, which was then not much known. "A Matchless Orator", Mrs. John Evans. "Frances E. Willard as a Temperance Worker," read by Mrs. Earl Kennedy. She was something of a seer. Taught temperance to children. 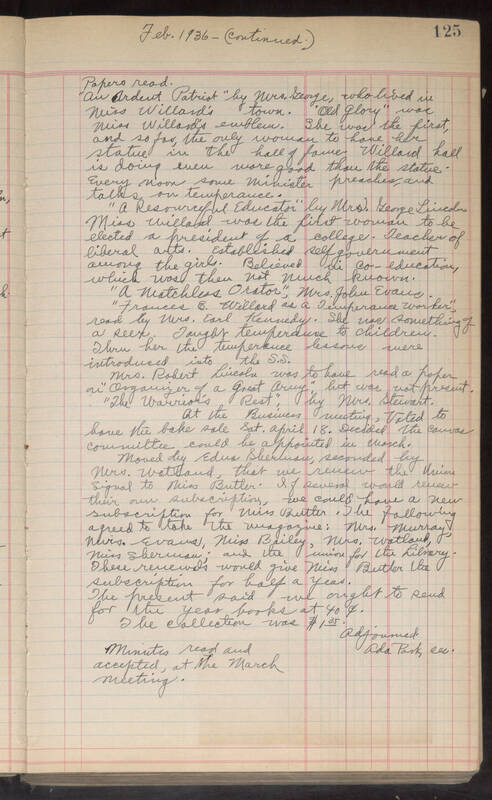 Thru her the temperance lessons were introduced into the S. S. Mrs. Robert Lincoln was to have read a paper on "Organizer of a Great Army", but was not present. "The Warrior's Rest", by Mrs. Stewart. At the Business meeting, Voted to have the bake sale Sat. april 18. Decided the canvas committee could be appointed in [illegible]. Moved by Edna Sherman, seconded by Mrs. Watland, that we review the Driver's Signal to Miss Butler. If several would review their own subscription, we could have a new subscription for Miss Butler. The following agreed to take the magazine: Mrs. Murray, Mrs. Evans, Miss Bailey, Mrs. Watland, Miss Sherman; and the union for the Library. These renewals would give Miss Butler the subscription for half a year. The present said we ought to send for the year books at 40c. The collection was $1 35. Adjounment. Ada Park, sec. Minutes read and accepted, at the March meeting.